Sometimes you will need to sell individual items even though you purchased them as a set. For example, if you purchased a "Miracle Set," your inventory will show that you have a "Miracle Set" but not the individual items. So, you need to know how to break those up. Or you may have the opposite problem. You have the individual items and want to assemble as set. I'll show you how. First, search the set you'd like to break up or assemble. 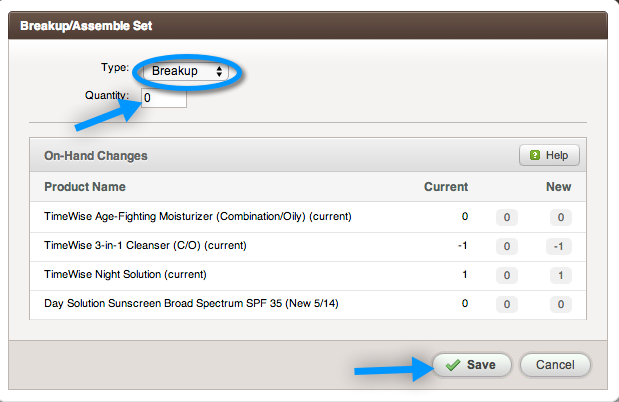 Click "Inventory" then in this case expand the skin care folder and choose "Timewise." Be sure to UNcheck the "only show on hand" box. Then click the part number of the set you want to break up or assemble. Once you have chosen the part number you are on the product information page. Click "Breakup/Assemble Set." Decide if you are breaking up or assembling the set and choose the correct option from the drop down menu along with the correct quantity of sets you'd like to break up or assemble. Then, don't forget to click "Save." You will be given a record of your transaction at the bottom of the screen. 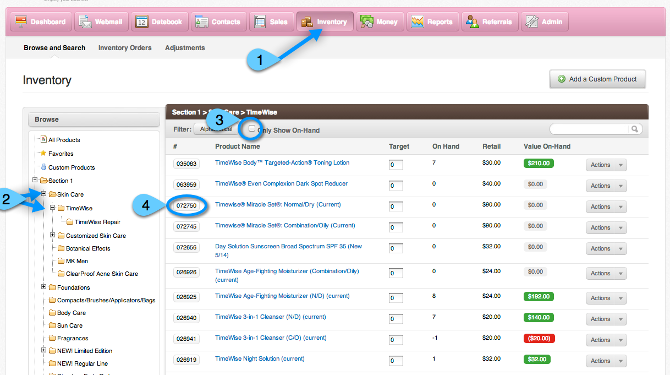 You can also click "Transaction History" to see every thing that has ever happened with that product. Nothing gets lost, ever! Remember, you cannot break up a set unless you have at least one on hand and you can't assemble a set if you don't have at least one of all the components on hand.